The BlackBerry “PlayBook” tablet computer was created by Research In Motion (RIM), a Canadian company that produces consumer electronics, and is best known for the BlackBerry smartphone. RIM co-CEO Mike Lazaridis and Adobe Systems Chief Technology Officer, Kevin Lynch, made the first public demonstration of the PlayBook on October 25th, 2010. Lazaridis described the tablet’s purpose as followed: “We’re not trying to dumb down the internet for a mobile device. What we’ve done is bring up mobile devices to the level of desktop computers”. RIM had all of the elements and tools to make the PlayBook a complete success and a feasibly strong competitor to Apple’s iPad. Indeed, their purpose was to make a “business device tablet”, one that busy jet-setting bosses would carry with them as a pocket computer, able to access all sorts of corporate application with it. In addition to having an outstanding quality, the Playbook tablet’s OP system is tremendously receptive and secure; moreover, its web browser is probably one of the most compatible and has higher performance than any device platform distributed in the market today! Its operating multitasking system (QNX) the PlayBook is unbelievable, according to Katherine Thomas. The tablet had all the technical features and brand support to be a complete success but sadly it was the opposite. Only fifty thousand devices were sold on launch day and half a million tablets were sold in its first quarter according to the sales figures disclosed by RIM. The company expected a million to be sold in the second quarter of 2011, but unfortunately less than a third of that target was reached, shipping only two thousand units. Their revenues were approximately $4.2 billion equaling their lowest revenue expectations for sales. But what were the reasons for failure behind this product? The short answer is that the PlayBook was rushed to market. Although the experts and engineers paid great attention to the product manufacturing, they lacked various elements people was counting on. These factors were: a) lack of a native email and calendaring, b) lack of good applications on the “BlackBerry Application World” for this device, c) It needs to connect up with a BlackBerry phone to access e-mail and contacts, d) most importantly, its late arrival on the market meant that it was undifferentiated from other tablets such as the honeycomb. The company also had a significant number of strategic management errors that contributed to the PlayBook’s failure, especially the marketing of it. They didn’t take advantage of the position of the worldwide Blackberry brand; further they limited their customers to specific mobile companies, such as AT&T, since the blackberry bridge was only permitted to be used by AT&T BlackBerry phones. These limitations dragged Playbook towards failure but the straw that broke the camel was the lack of a back-end service to support the product. It has been argued that this big error was a trade-off in order to launch the device within the time frame stipulated for it to compete with the Ipad 2 or the other android devices. RIM could have delayed its launch until the product was complete in order to compete with the iPad when the back-end support existed. Also as nice as some people think Blackberry smartphones are, they’re a pale imitation in comparison to Apple and Google products; you do not want to compete with these two giants with a product that is not well designed. RIM has always been considered a company for enterprises because of the usefulness of their blackberry devices; introducing a new product to end-consumers without enough marketing campaigns and limited suppliers can be an overwhelming challenge. 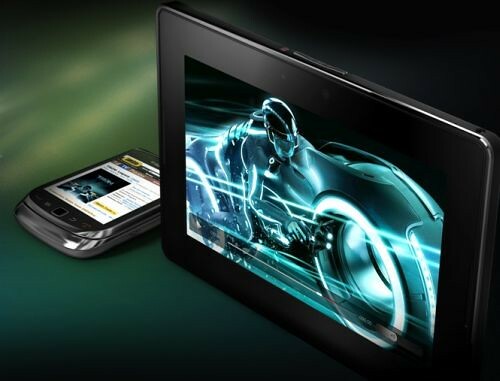 At this moment, RIM is facing very serious problems since all major cell providers from the United States, such as Verizon, Sprint and AT&T will not continue to carry the Playbook tablet, denouncing the late launch of it in comparison to other tablets. This is leaving RIM behind, forcing it to develop all the applications, pay for all the marketing, and promote the Playbook to business customers all by itself, without the help of the wireless communications giants. Some say that RIM can’t find any new marketing innovation for its Playbook, so its tablet division is destined for ruin. More over, Research In Motion has been losing market share in it phone division and has lower revenues than that which had been forecasted, for example on their fourth quarter they expected to have $5.2-$5.6billions and profits of between $770-812m. Instead, they both came in lower by 40% For a company that is cutting job, rebuying their stocks and witnessing the painfully slow death of its once successful Blackberry, it will be interesting to see how RIM manages with yet another failure. This entry was posted in Analysis, BizDev, Champions & Spoilers, Design, Innovation, Marketing and tagged Playbook, RIM, Tablet by amonca58. Bookmark the permalink.